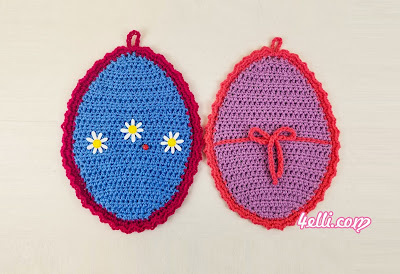 How to crochet Easter Egg Potholders!! Row 1: 1hdc into the 2nd chain from hook, 1hdc in each chain across. Row 2: chain 1, turn, 3hdc into the 1st stitch, 1hdc in each stitch across until 1 stitch remains, 3 hdc into the last stitch. Round 1: add a new color if you like on top of egg, make 1sc in each stitch and loop around. *do your best to have an even number of sc in the end of round. Decorate your potholders as you wish!